The Chaos Communication Camp in Mildenberg is an open-air hacker camp and party that takes place every four years, organized by the Chaos Computer Club (CCC). Thousands of hackers, technology freaks, artists and utopians get together in a field for five days in the Brandenburg high summer – to communicate, learn, hack on things and party together. We focus on topics such as information technology, digital security, hacking, crafting, making and breaking, and we engage in creative, sceptical discourse on the interaction between technology and society. 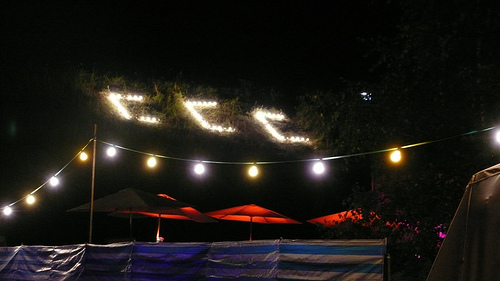 Apart from the official conference program, the Chaos Communication Camp also offers space for community villages, developer and project meetings, art installations, lightning talks and numerous workshops (called “sessions”). LOLWTF was yesterday. Today we learn from failures – both our own and those of others. Failures are frowned upon and we don’t talk much about them. We’d rather cover something up, than to speak about it and share it. Many developers – regardless of whether their software is open-source or proprietary – don’t talk about their failures. This needs to change. Open-source developers who work on projects that affect everybody are usually ridiculed and criticized whenever security vulnerabilities are published. This doesn’t just hurt the community, but also the backers of the projects. Software errors are practically unavoidable if you don’t know how to prevent them. This track is dedicated to those who have experience with failures, so that others can learn from their mistakes and experiences. Please speak about your shipwrecked projects and your failures – you will be the bravest participants at the event. One can create art and beauty with any technology, including computers. This track awaits submissions that address, from an artistic perspective, the societal changes and contradictions caused by computers, robots and general digitalization. We’re open to art installations, performances, concerts, readings, etc., that involve past, contemporary or upcoming technologies. We’re looking forward to submissions which (without citing Deleuze) address present and future societal, ethical and political questions that arise from the technologization and digitalization of all aspects of life. What will the future bring? Which commercial and political interests are in the way of a utopia worth living? This track is all about developing and creatively using things that allow the digital to make a physical impression. Reverse engineers, microcontroller developers and quantum physicists are all very welcome. Decapped smart cards and system-on-chips, sanded-down PCBs and reverse-engineered firmware should feel right at home, next to the cocktail-mixing 3D-printer and the hidden nuclear reactor you are secretly operating in your basement. The focus is on all kinds of hardware design, the expansion and liberation of proprietary system, getting your hands dirty – and of course rocket science! For this track we would like to request submissions that show how hardware and software can be made either more secure or less secure. If you want to share your discoveries with thousands of fellow security enthusiasts, if you have developed new solutions to previously unsolved problems or if you have found new problems which we knew nothing about, then this is the right track for you. But remember: If you break it, you fix it. Besides topics in the social sciences, such as the history of secret services, research of alternative coexistence or alternative economies, we are also interested in pressing questions of humanity’s growing need for energy, drug-resistant pathogens or access to drinking water. Furthermore, the big questions are also relevant: Are we alone in the universe? How does life work? How do I detect an infinite loop? All submissions of lectures and workshops have to be entered into our conference planning system, which is located at the following URL: https://frab.cccv.de/cfp/camp2015. Please follow the instructions there. If you have any questions regarding the submission, you are welcome to contact us via mail at camp2015-content(at)cccv.de. As it is likely that there will be multiple submissions on the same topic, please show us exactly why your talk should be part of the conference. Remember that the teams are diversely staffed, and not every reviewer knows every submitter and their background. Please write something about yourself, your environment and your motivation. It does not matter if the talk has been held at another conference, as long as it is up to date and relevant. Talks should be no longer than 45 minutes plus 15 minutes for questions and answers. Longer slots are possible in principle. There are also 20 minute slots. Please tell us the proposed length of your talk at the time of submission. In addition, there are 5 minute short talks (so-called Lightning Talks) for small ideas, projects, or rants. These will only be organised during the event. Although the Chaos Communication Camp is an international event and a lot of content is being presented in English, this year there will again be a translation team that will simultaneously translate most German talks into English. So if you are not completely comfortable with presenting in English, please present your lecture in German. Please also use the language of your presentation for its title, so as not to confuse any visitors. Audio and video recordings of the lectures will be published online in various formats under the Creative Commons Attribution 3.0 Germany (CC-BY 3.0 DE) license. This license allows commercial use of excerpts by media institutions as part of their reporting. If you do not wish for material from your lecture to be published or streamed, please let us know in your submission. Note: As German law (and therefore the license) might differ from the law of your country, please let us know if you should have any issues or questions regarding the exact implications. Unfortunately, we can’t guarantee a perfect translation. For projects, installations and other fun things is a formal submission not required. There will be a wiki again where requirements for space and other resources will be kept track of. Simply start considering already now what you would like to make, bring or show, and write it down once the wiki goes online. We have a lot of space and we are open to crazy and surprising stuff. The Chaos Communication Camp is a great adventure for us, also financially. As we’re all there to have a nice time together, and split the costs, we cannot offer a different entrance fee for speakers, workshop organizers or angels. The camp is a non-commercial event where neither the organisers nor the speakers are being paid – thus, we cannot provide a free entrance ticket, even for speakers. If necessary, we are however able to provide limited support for travel costs and accommodation. If you need help applying for a visa, such as an official invitation to present to the German embassy, please let the content team know well in advance. Please be aware that the visa application procedure may take up to six weeks. Das Chaos Communication Camp ist das alle vier Jahre stattfindende Hacker-Treffen und die Open-Air-Hackerparty des Chaos Computer Clubs (CCC). An fünf Tagen im Brandenburgischen Hochsommer kommen tausende Hacker, Technikfreaks, Bastler, Künstler und Utopisten auf dem Camp-Gelände zusammen, um sich auszutauschen, voneinander zu lernen und miteinander zu feiern. Wir beschäftigen uns mit Themen rund um Informationstechnologie, Computersicherheit, Hacking, mit der Make- und Break-Szene, dem kritisch-schöpferischen Umgang mit Technologie und deren Auswirkungen auf unsere Gesellschaft. Jenseits des Konferenzprogramms bietet das Camp Raum für Community-Villages, Entwickler- und Projektgruppentreffen, Installationen, Lightning Talks sowie zahlreiche Workshops. LOLWTF war gestern. Heute versuchen wir, aus den eigenen und den Fehlern anderer zu lernen. Fehler sind verpönt, und es wird nicht viel darüber gesprochen: vertuschen statt teilen. Viele Programmierer – egal unter welcher Lizenz entwickelt wird – sprechen nicht über ihre Fehler. Das müssen wir ändern. Insbesondere die Open-Source-Entwickler, die an Projekten mitwirken, die unser aller Leben beeinträchtigen, werden nach Bekanntwerden einer Sicherheitslücke oft einem Shitstorm ausgesetzt und der Lächerlichkeit preisgegeben. Das schadet der Community und den individuellen Persönlichkeiten, die hinter dem jeweiligen Projekt stehen. Fehler in Software sind quasi unvermeidbar, wenn man nicht weiß, wie man sie verhindert. In diesem Track sollen diejenigen zu Wort kommen, die über ihre eigenen Fehler oder Erfahrungen sprechen möchten, damit andere daraus eine Lehre ziehen können. Bitte sprecht über Eure misslungenen Projekte und Eure Fehler; dann seid Ihr mit Abstand die mutigsten Teilnehmer der gesamten Veranstaltung. In diesen Track passen alle Einreichungen für Vorträge, die sich aus der künstlerischen Perspektive oder mittels künstlerischer Ausdrucksformen mit den gesellschaftlichen Veränderungen und Widersprüchen durch Computer, Roboter oder Digitalisierung auseinandersetzen. Hier bitten wir um Einreichungen, die sich mit den gesellschaftlichen, ethischen und politischen Fragen auseinandersetzen, die sich durch die Technisierung und Digitalisierung aller Lebensbereiche ergeben. Was wird die Zukunft bringen, welche kommerziellen und politischen Interessen stehen einer lebenswerten Utopie im Wege, wie können wir sie überwinden? In diesem Track dreht sich alles um den kreativen Umgang mit sowie die Entwicklung von Dingen, welche einen physikalischen Eindruck hinterlassen. Hier sind Einreichungen vom Reverse-Engineerer über den Mircrocrontroller-Bastler bis zum Raktentechniker, Quantenphysiker und Kernschmelzer willkommen. Aufgeschliffene Smartcards, Platinen und SoCs, reverse-engineerte Firmwares, aber auch der Cocktails mixende 3D-Drucker und heimlich im Keller betriebene Nuklearreaktor sind hier zu Hause. Der Fokus dieses Tracks liegt auf dem Design von Hardware jedweder Art, dem Erweitern bestehender sowie der Befreiung durch den Hersteller verschlossener proprietärer Systeme, schmutzigen Fingern – und natürlich Rocket-Science! In diesem Track wünschen wir uns Einreichungen, die zeigen, wie man Hard- und Software sicherer oder unsicherer machen kann. Wenn Du bereit bist, den Spaß an Deinen Entdeckungen mit tausenden Security-Enthusiasten zu teilen, ist dies Dein Track. Wenn Du neue Lösungen für bisher ungelöste Probleme entwickelt hast, ist dies Dein Track. Wenn Du neue Probleme entdeckt hast, von denen wir gar nicht wussten, dass es sie gibt, ist dies Dein Track. Aber denk daran: Wer etwas kaputtmacht, muss es auch reparieren! Neben gesellschaftswissenschaftlichen Exkursen wie der Geschichte von Geheimdiensten, der Erforschung alternativer Koexistenzformen und alternativer Wirtschaftssysteme, interessieren uns auch drängende technische Probleme wie der steigende Energiebedarf der Menschheit, resistente Krankheitserreger oder der Zugang zu Trinkwasser. Die großen Fragen bleiben natürlich relevant: Sind wir allein im Universum? Wie funktioniert das Leben? Wie erkenne ich eine Endlosschleife? Alle Vortrags- und Workshop-Vorschläge müssen über ein Konferenz-Planungssystem eingegeben werden, das sich unter folgender Adresse befindet: https://frab.cccv.de/cfp/camp2015. Bitte folge den Anweisungen, die sich dort finden. Wenn es Fragen bezüglich der Einreichung gibt, kannst Du uns gerne unter der E-Mailadressse camp2015-content(at)cccv.de erreichen. Bitte schicke uns eine sinnvolle und möglichst komplette Beschreibung Deines Vortragvorschlages. Gerade die Beschreibung hat einen großen Einfluss auf die Auswahl und sollte deswegen sehr aussagekräftig sein. Qualität geht natürlich vor Quantität. Marketing- und Sales-Droiden verschwinden bekanntermaßen von dieser Veranstaltung, ohne eine Spur zu hinterlassen. Es ist also nicht sinnvoll, Firmen- oder Produktpropaganda überhaupt einzureichen. Da die Chance groß ist, dass mehrere Leute einen Talk zum gleichen Thema einreichen, zeige uns bitte ganz genau, warum ausgerechnet Dein Talk dabei sein sollte – denke daran, dass die Teams divers besetzt sind und nicht alle Kuratoren jeden Einreicher und deren Hintergrund kennen. Es kann hilfreich sein, bei der Einreichung etwas über Dich selbst, Dein Umfeld oder Deine Motivation zu schreiben. Es ist uns vollkommen egal, ob der Talk schon einmal auf einer anderen Konferenz irgendwo auf dem Planeten stattgefunden hat. Wir bitten nur darum, dass der Talk aktuell ist. Vorträge sollten nicht länger dauern als 45 Minuten plus 15 Minuten für Fragen und Antworten. Ausnahmen bestätigen die Regel. Es gibt außerdem 20-Minuten-Slots. Bitte teile uns bei der Einreichung mit, wie lange Dein Vortrag dauern soll. Darüberhinaus gibt es noch fünfminütige Kurzvorträge (sogenannte Lightning Talks) für kleine Ideen, Projekte oder Rants, die erst auf der Veranstaltung koordiniert werden. Da das Camp eine internationale Konferenz ist, werden viele Inhalte auf Englisch präsentiert. Solltest du Dich in Deinem Englisch aber nicht absolut sicher fühlen, halte den Vortrag bitte auf Deutsch. Wir versuchen, so viele Talks wie möglich simultan zu übersetzen. Bitte verwende die Sprache des Talks auch im Titel, um Besucher nicht zu verwirren. Die Audio- und Video-Aufnahmen der Vorträge werden online in verschiedenen Formaten veröffentlicht und unter die CC-Lizenz, Namensnennung 3.0 Deutschland (CC BY 3.0 DE) gestellt. Für Medien erlaubt diese Lizenz die kommerzielle Nutzung von Ausschnitten im Rahmen ihrer Berichterstattung. Wenn keine Veröffentlichung oder kein Streaming für Deinen Vortrag stattfinden soll, teile uns das bitte bei der Einreichung mit. Eine formale Einreichung ist nicht nötig. Wir werden wieder ein Wiki haben, in dem wir den Bedarf an Platz und anderen Dingen sammeln werden. Fange einfach schon einmal an, darüber nachzudenken, was Du machen, mitbringen oder zeigen willst, bevor dieses Wiki online geht. Wir haben sehr viel Platz und sind offen für Verrücktes und Überraschendes. Das Chaos Communication Camp ist für uns ein großes Abenteuer, auch finanzieller Natur. Da wir dort alle zusammen eine gute Zeit haben wollen und die Kosten unter uns aufteilen, können wir zwischen Workshops, Vorträgen und Engeln auch im Eintritt keinen Unterschied machen. Das Chaos Communication Camp ist ein nicht-kommerzielles Event und weder die Macher noch die Speaker werden bezahlt. Als Speaker bekommst Du auf dem Camp keinen freien Eintritt. Bei Bedarf ist es möglich, Unterstützung bei Fahrtkosten und Unterkunft zu beantragen. Benötigst Du Hilfe bei der Beantragung eines Visums, zum Beispiel eine offizielle Einladung zur Vorlage bei der Deutschen Botschaft, sage dem Content-Team bitte rechtzeitig Bescheid. Bitte berücksichtige, dass die Beantragung eines Visums bis zu sechs Wochen dauern kann.